Never forget any Indian festivals & religious dates. Send email to festivals@Plasticthali.com with word "subscribe" in subject to get free alerts in your mailbox. These plates have six deep compartments specially designed for Indian, Asian and Japanese(Sushi) food. 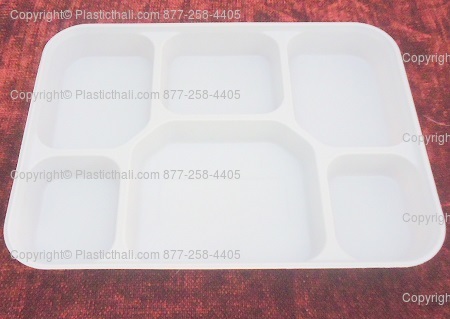 These 6 compartment plates also called large six section disposable plastic plate and can hold curries and dishes at a party. They are perfect for lunches with couple of Indian dishes. This plate is bigger than usual small six compartment plate available in the market. Checkout the dimension of the plate and how Large each section is !